My dad is in town visiting right now, so I thought it would be fun to watch a movie with him and the kids and make a treat to go along with it. As I was trying to think of a fun movie-themed treat, I couldn’t help but think about Arrested Development and the banana stand. But since Arrested Development isn’t exactly geared towards the elementary-school set, I had to get a little creative. Here was my crazy thought process. Third, we are having a heatwave right now and I thought a frozen treat would be mighty delicious. Fourth, I love the book Jumanji (I even have a first edition as a decoration in our living room) and was super excited when I found out the Jumanji movie was on Netflix (thanks to my sister for letting me know – she was obsessed with that movie when we were kids!). There are lots of monkeys in Jumanji. Monkeys love bananas. I hear they even go for frozen bananas occasionally. Where does all this lead to? 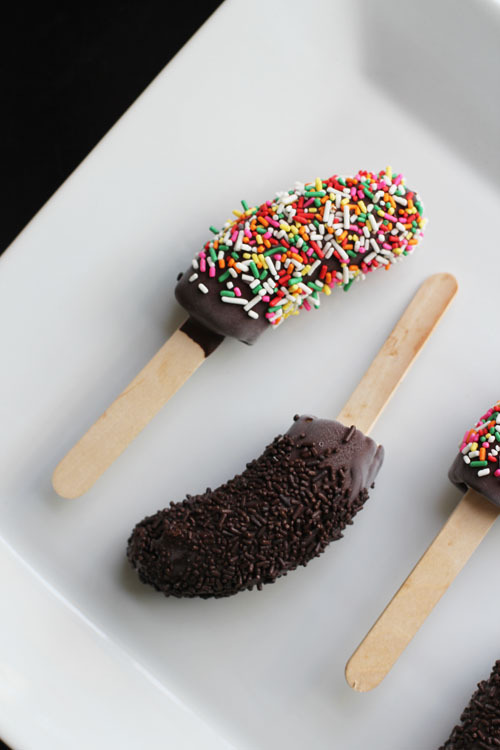 Homemade chocolate-dipped frozen bananas, of course! I decided frozen bananas would be a great treat to get us excited for watching Jumanji. And, after the kids went to bed, maybe a few episodes of Arrested Development, too. 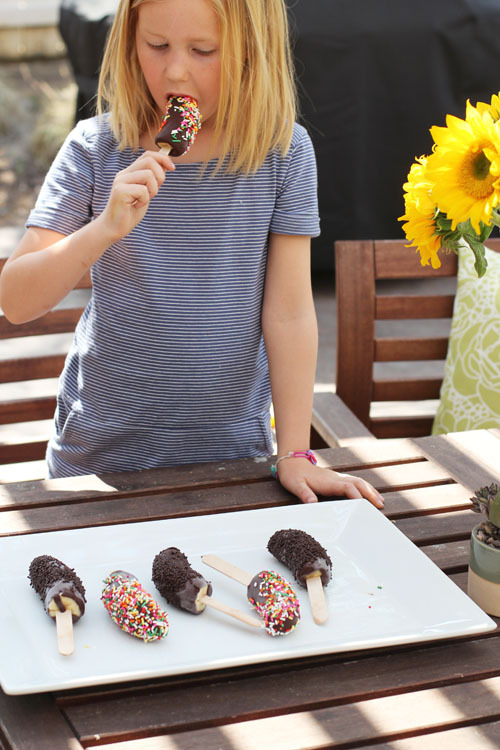 This chocolate-dipped frozen banana recipe is super simple, and it is amazing how incredibly cute and professional-looking the bananas come out! Seriously, when I took them out of the freezer, Nate thought I had bought them at a store! In addition to being fast and easy, Anna my 6-year-old was a huge help while making the bananas and we had a lot of fun cooking together. Also, we have determined that there really is always money in the banana stand. The frozen bananas were so cute and so delicious Nate and the kids decided we should start a business. And that we would most certainly make a big fat profit on frozen bananas (there was math involved). And that the banana stand should be called “Jane’s Bananas” (10 points to Nate for the clever name). The whole time they were talking I just kept thinking “This is awesome blog post material.” They didn’t even know that I was going to be writing a post about the bananas we were eating. This post practically wrote itself, people. The DIY version of what you get on Balboa Island in Newport Beach, CA. Papa Bluth would be proud. Peel bananas and cut in half (see photo). Using a knife, cut a hole in the center of the banana, about 2 inches deep into the banana, starting at the cut end. Place popsicle stick in pre-cut hole, holding banana fairly firmly with the other hand to prevent it from splitting as the popsicle stick is pressed in. Place on lined cookie sheet and freeze for about an hour. Before taking bananas out of the freezer, melt coconut oil and chocolate chips in a microwave-safe bowl in the microwave on high for 1 minute. Remove and stir well until all chocolate chips have melted. Take bananas out of the freezer. 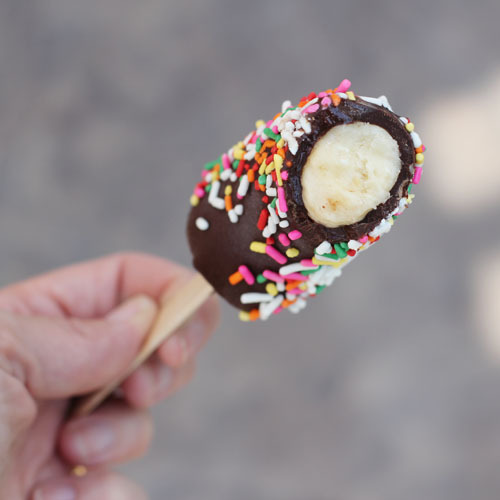 For each banana, dip in the chocolate, being sure to cover the whole banana (you can use a spoon to help). Let excess chocolate drip off. Chocolate will temper (harden) quickly since the bananas are cold, so work fast. 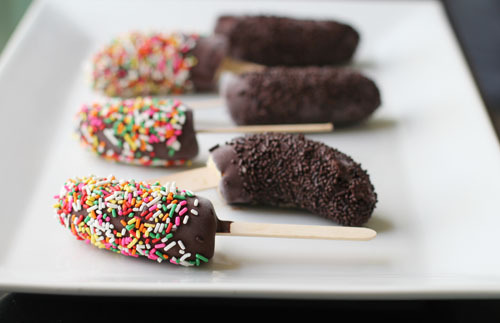 Before chocolate hardens, pour sprinkles over the banana (over a bowl or plate) to cover, if using sprinkles. Hold banana in the air for 1-2 minutes, then place on the lined cooke sheet. (This is the part that Anna helped me so much with – she would hold the bananas while I dipped the next one.) Keep frozen until ready to eat! If not eating right away, freeze for about 30 minutes then place in an airtight container or zip plastic bag in the freezer. As I dug around for frozen banana recipes for inspiration, this “wordless recipe” from my friend Irvin at Eat the Love was my favorite by far and was my main guide into the world of frozen bananas. Thanks, Irvin! Love that you used coconut oil with the chocolate in this. I’ve been using it more lately and really like it. Great recipe to make and enjoy with kids of all ages! I am just really loving coconut oil – slowly adding it to more and more things! YUM! 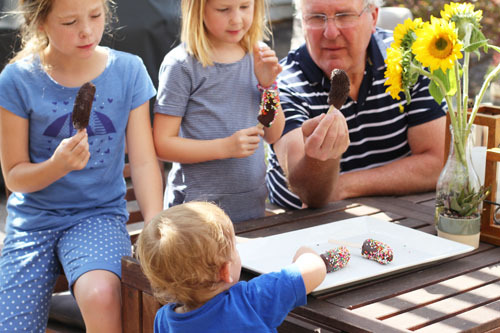 such a fun summer treat–pinning! Talk about the perfect summer snack! Making these ASAP! I LOVE the photos, Jane!!! 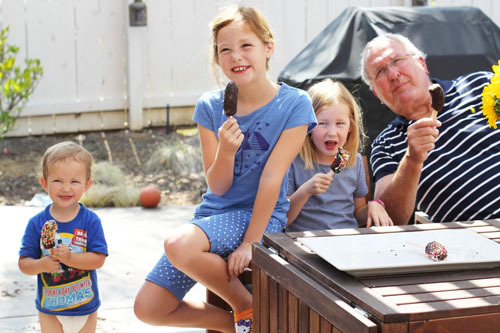 This is my absolute favorite summer treat!